Macédoine is a chopped salad of various ingredients. The name refers to the diverse mix of people in Alexander the Great’s Macedonia and the term can be used on any medley of disparate items. 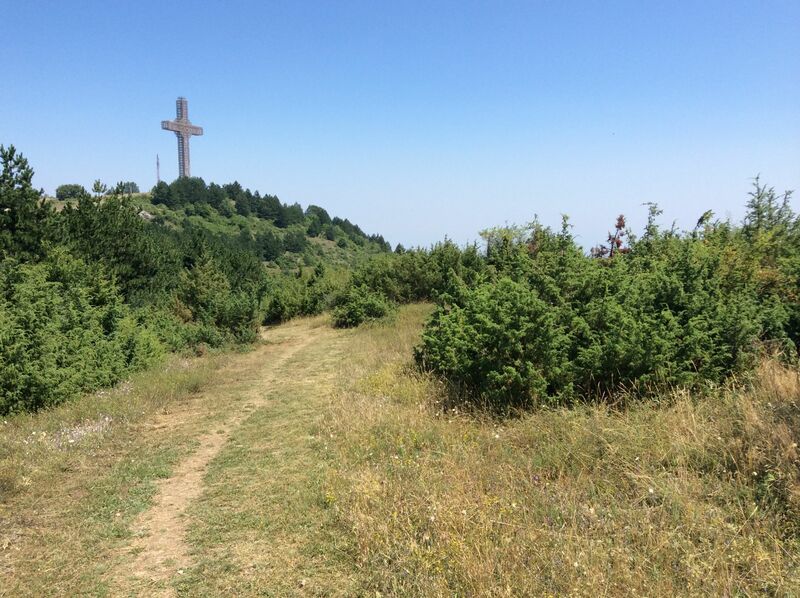 Here SWMBO offers a macédoine of the last couple of weeks in Macedonia. 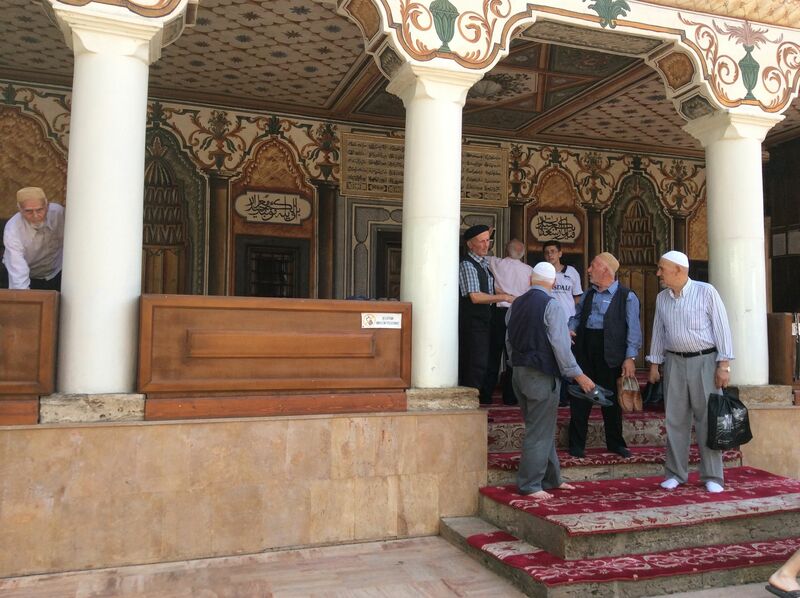 Usually referred to as the Motley Mosque in English, it is one of the most beautiful mosques in the Balkans and unusual in its intricately painted exterior. 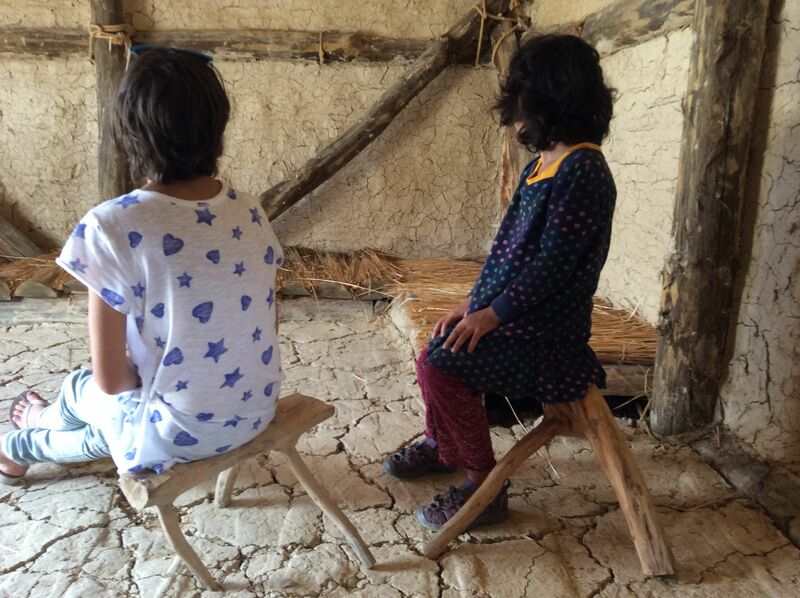 Built in 1459, the two women who paid to have the mosque erected are interred in the building. The grounds are exquisite. 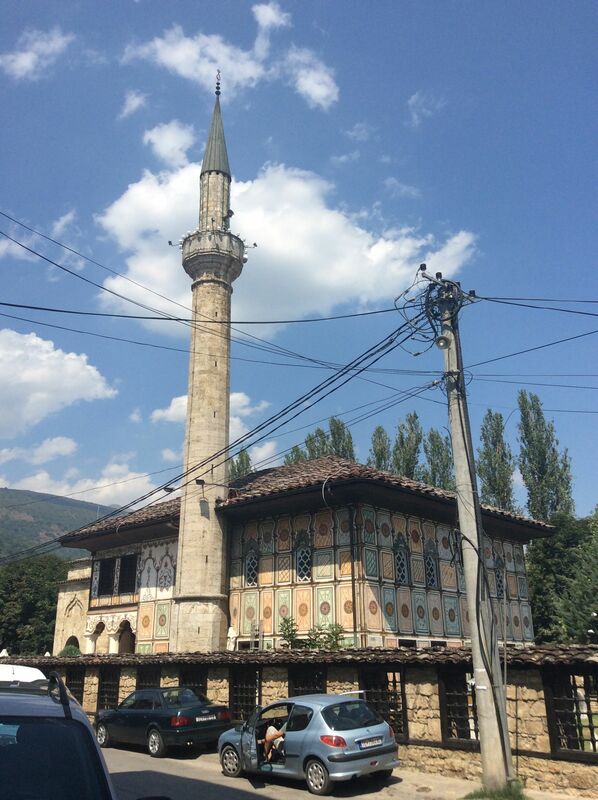 This mosque is located in the Albanian town of Tetovo. An Albanian town in Macedonia? What gives? Stay tuned for a future blog post on what “Albanian” actually means. 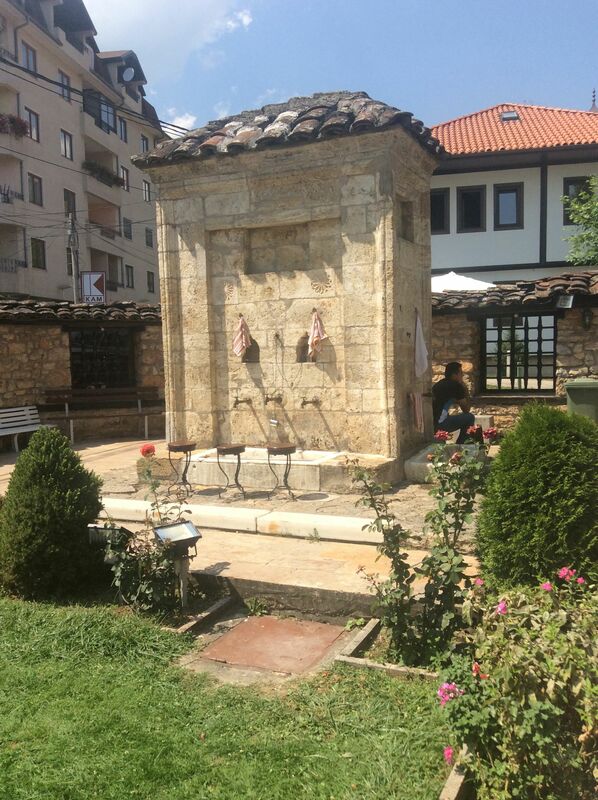 This teeny, tiny treasure is found in the old town of Ohrid. The entrance is free and the whole visit takes about 10 minutes, making it the perfect museum for the modern attention span! You can purchase beautiful prints made onsite. 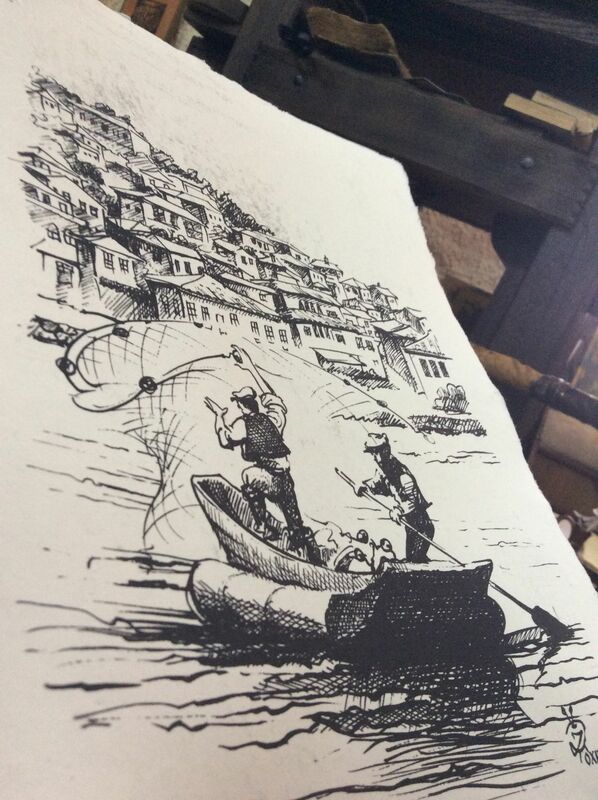 We, of course, wanted to buy the print that was made right in front of us but the paper maker was reluctant to sell it because it was smudged. We convinced him that we would be happier with the wabi sabi version (the Japanese idea of wabi sabi being beauty in imperfection). Well worth 150 dinars ($3.75). 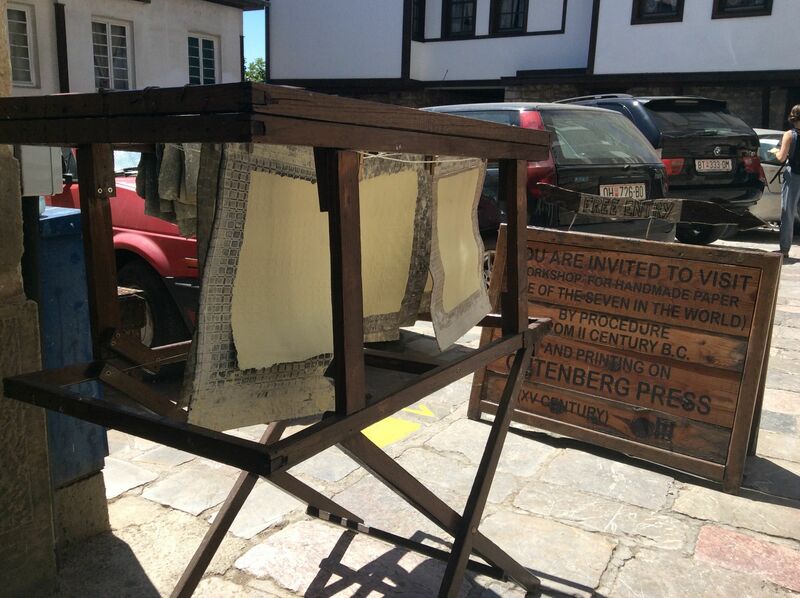 The paper is made using a technique invented in China in the 2nd century BC and the workshop claims to be one of only seven in the world still using this technique. Not sure what that means. They mix hard wood shavings, cotton and water and let the sludge sit for 23 to 31 days. Then sometimes flowers and seeds are added for decoration and it is pressed into paper. 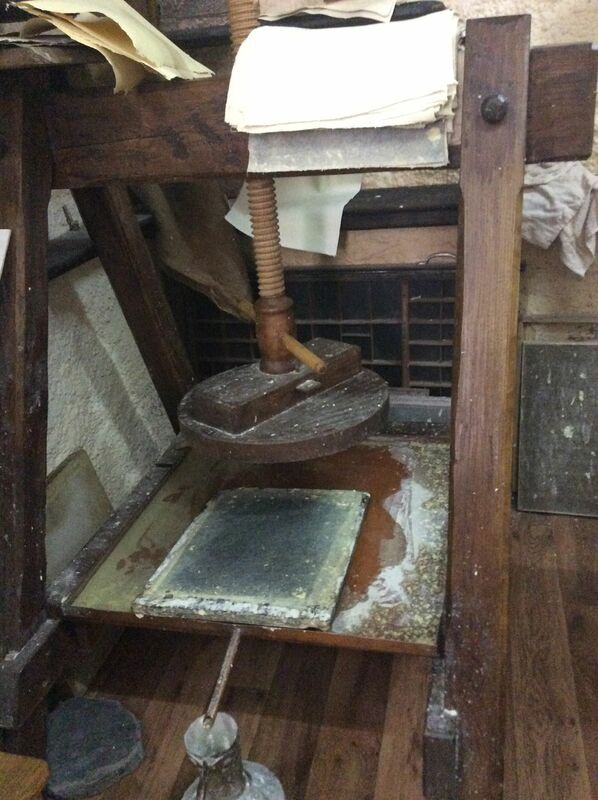 The prints are made individually by hand on a 150 year old copy of the Gutenberg press. The copper plates are carved by local artists and last for at least 2000 copies. 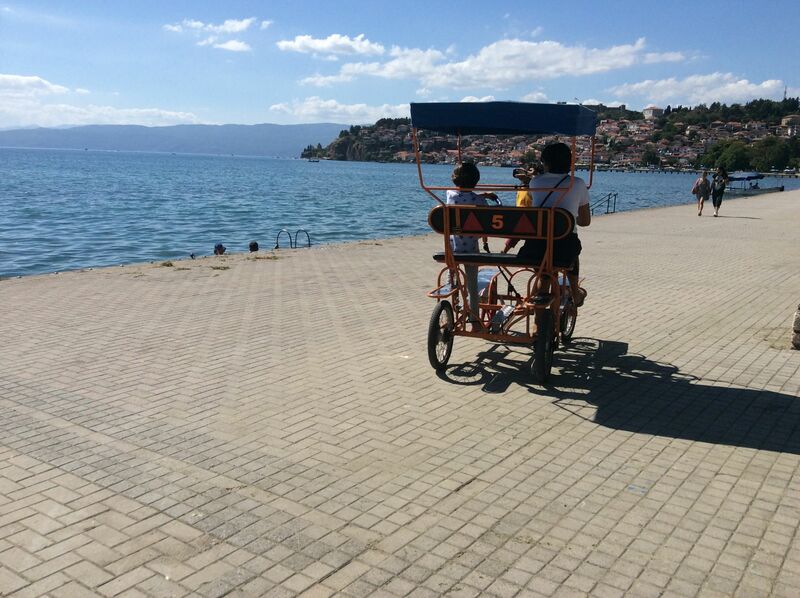 Ohrid in the summertime, is host to one festival after another. Now, it’s the Old Timer Festival (vintage cars). Piano Summer Ohrid runs from August 17-27. When we drove the three hours from Skopje to Ohrid yesterday, we were always in the midst of a group of pristine show cars. 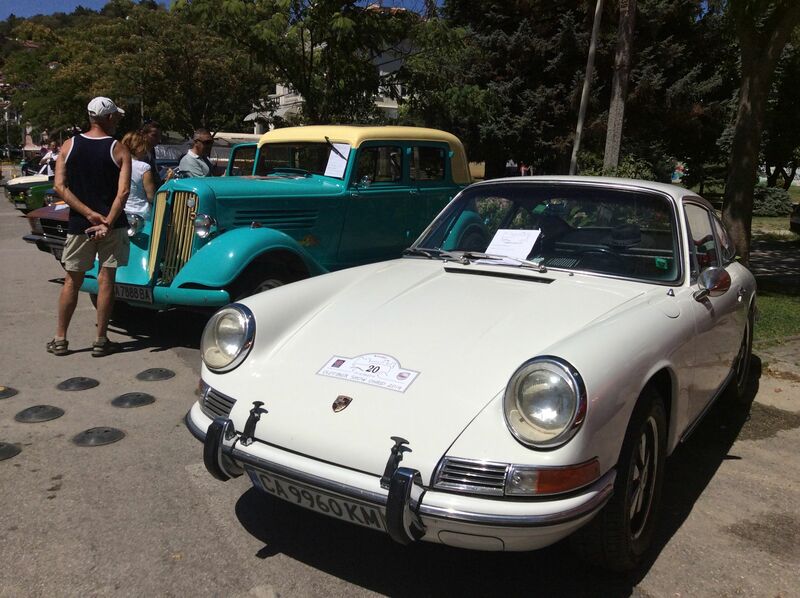 Old porsches, skodas and fords. Now we know why! We rode on the highway with these two! SWMBO, Venice and Lastborn on their own type of old timer! 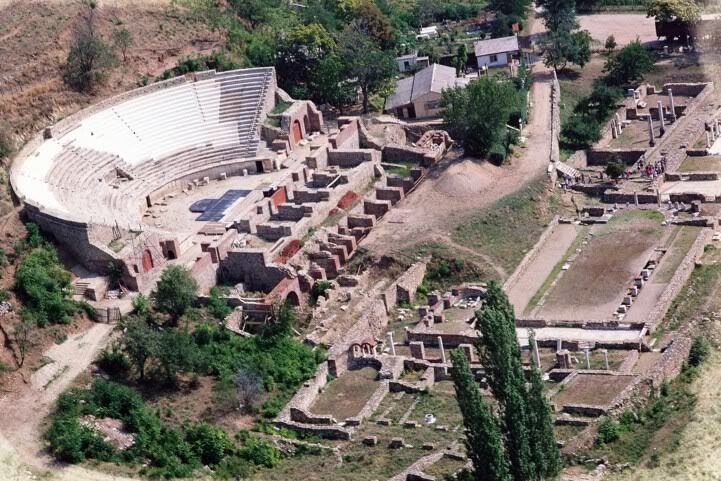 Heraclea is located just outside the southern city of Bitola. It is an interesting, partially unearthed archaeological site. We all enjoyed it despite the heat. The city was founded by Philip of Macedonia in the 4th century BC and remained important under Roman rule and in Early Christian times. 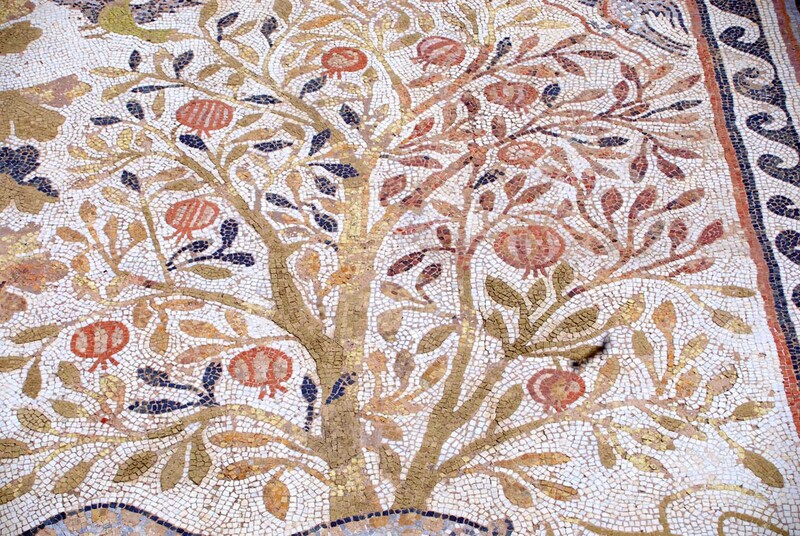 The site contains some spectacular early Christian mosaics. While the entrance fee is minimal, the fee to take pictures is about 3 times as much as an entrance ticket. Ergo, the photos below are from the web. The Bay of Bones Museum is an underwater archaeology museum on the shores of Lake Ohrid. 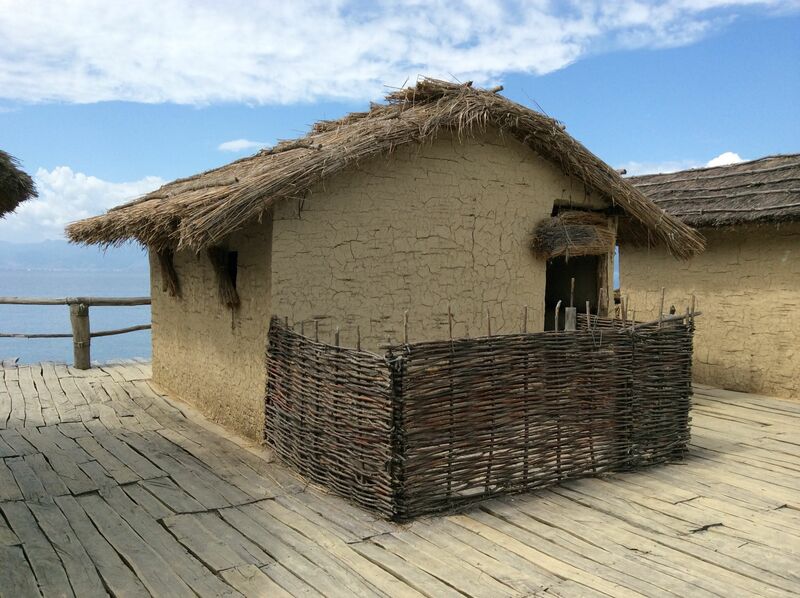 Around 3000 years ago, a community lived in a stilt village built out on the lake. Extensive underwater archaeology has been undertaken here and in 2008, the village was recreated to show what they believe it would have been like. There is also a small museum building and a dive centre where you can take a scuba lesson, then head out to view some archaeological remains still underwater. We spent a pleasant half hour sitting in the shade by the water’s edge watching a handful of people getting a scuba lesson. We were impressed with the dive teachers and the more we sat, the more awesome it looked. Result? Fahbio, Onlyboy and Paris are going back tomorrow to give it a go.